Trojan's manager Paul Higgins with Armagh City manager at the Tennents Irish Cup 5th Round draw at the National Football Stadium at Windsor Park. TROJANS manager, Paul Higgins recognises his side go into tomorrow’s Irish Cup fifth round clash with Championship outfit Armagh City as ‘massive underdogs’ but he believes the Creggan men are capable of pulling off a real shock! It’s one of the biggest matches in the history of the Oakland Park club and a place in the last 16 of the Irish League’s Blue Riband competition and a potential tie against one of the big Belfast clubs is still within their grasps. Firstly the Creggan men need to see off the challenge of Armagh City at Holm Park (Kick-off 3 p.m.) but Higgins reckons his players go into the game with the ‘belief’ they can keep their Irish Cup fairytale alive. “We’re all looking forward to it,” said the Trojans boss. “It’s a big day out for the club. It’s a big day for myself and we’ve never been to the fifth round so the whole club’s on a buzz at the minute. The players can’t wait. Trojans have defeated Immaculata (3-1), Crumlin Star (1-2), 18th Newtonabbey Old Boys and Drumaness Mills (3-1) along the way and although Higgins is reluctant to look beyond Championship strugglers, Armagh City, it’s a fantastic chance for the Creggan men to progress. We didn’t get the fairytale tie against one of the big Belfast teams we were hoping for but we’ve got a tie we could get something out of. We go in as massive underdogs but we’re working on getting something out of the game. And we go in with belief! “We’ve played well during those opening rounds. And going in as underdogs suits us. It takes the pressure off us. But our boys don’t feel under any pressure, they just go out and express themselves and do what they can. “If we get something out of it then brilliant, but we’re going for the experience. It’s a day out for the club and a big occasion for us. Higgins is hopeful his side, which boasts a nice blend of both youth and experience, will be in the hat for the sixth round draw which takes place at 5.30 p.m. tomorrow evening. And why shouldn’t he be optimistic as they go into the game on the back of a four game winning run in the N. Ireland Intermediate League? With former senior players such as Darren McCready, Darren McFadden and Eugene Ferry to call upon, Trojans certainly won’t be pushovers and the plastic pitch at Holm Park should work in their favour. The club even had a helping hand by former manager, Kevin Deery who won an historic treble for the local junior side prior to taking the Institute hotseat, as he fielded a strong team against his old side in a friendly match at the Riverside Stadium on Tuesday night. ‘Stute won that game 2-0 with Sammy Morrow and Ryan Doherty getting the goals, but it was a very worthwhile exercise for Higgins’ men in preparation for Saturday’s Irish Cup clash. “The Christmas break came at the wrong time for us but we had a friendly on Tuesday night at Institute to keep us going. Armagh boast former Institute and Derry City and Institute goalkeeper John Connolly and Higgins expects a tough, physical encounter. 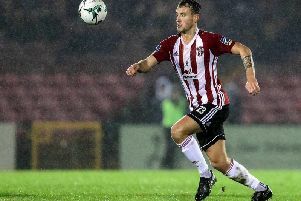 There’s a few players in his own squad who certainly are not shrinking violets, with Brian McClean in defence and ex-Derry City and Stute midfielder, Tommy McBride also in the side.